These sandals are more than just fancy footwear. 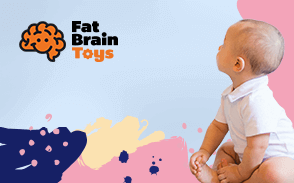 Baby’s feet, cute and pudgy as they appear, are largely made of fat and cartilage. As they grow, that cartilage becomes bone. This means that little ones need footwear that is supportive, protective, and a solid fit, to ensure the most successful and healthy development. Toddlers, an active and curious age group, especially need to be fitted with the right kinds of footwear. If the warmer months are rolling in and you’re in the market for a new pair of sandals for your tot, take a look at our ten favorite picks. These shoes are guaranteed to be durable, supportive, and downright adorable. Keep those little toes cool this summer in a swanky pair of sandals! We've got all the best sandals for kids and toddlers displayed for you in our brand new buying guide format. The Born Cute Research Team strives to make sure that all of our guides are up to date with the best products currently available to you. The following sandals have all been reviewed to guarantee quality and accessibility. Toddle on, little tots! This sandal is where water friendly and lightweight come together to create a great adventure and warm weather shoe. 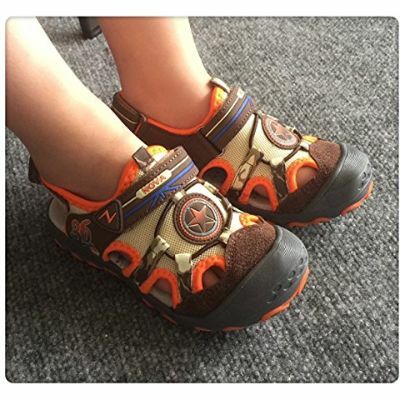 When toddlers are on their feet and ready for adventures these sandals are great to keep their little feet supported and refreshed. The lightweight design and aqua ready upper is constructed from a synthetic material that also features easy to strap closures. Sandals are great to be able to hand to a toddler and allow them to place them on their selves. This super water friendly and supportive two-strap sandal offers all the feature of a great sandal that is toddler ready. These sandals are great for warm weather and offer an easy to put on a strapping system that will leave any toddler feeling independent. When toddlers are given the responsibility of placing and securing their own footwear it allows them to engage in fine motor skill development, promote their gross motor skill and practice a social developmental skill. 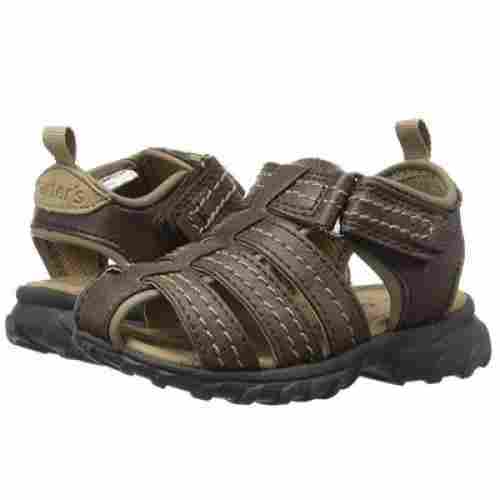 These toddler friendly sandals are easy for them to put on and be ready to go out and enjoy the warm air quickly. 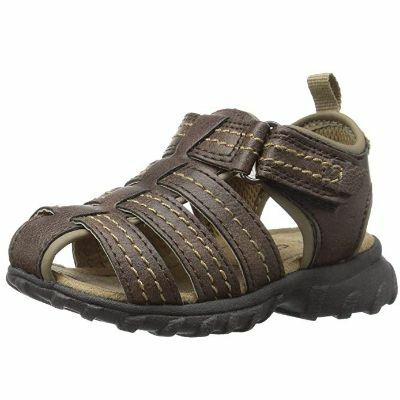 The water friendly upper with the super traction sole makes it a great sandal for adventures. Easy to loop around and hook straps allow this sandal to have the perfect and secure fit each time. The sole of the sandal has also been treated with an antimicrobial treatment that helps prevent odors from occurring. This sole is also lightweight and has been formed from non-marking rubber that creates a great support system and offers optimal traction. Your little one will feel pretty, witty, and bright—guaranteed. These Leather Princess Sandals feature a durable rubber sole, 100% genuine soft leather, and a cushioned footbed for comfort and support. A sweet flower adorns the top, making it the perfect summer sandal for any outfit. A good pair of sandals keeps toddlers comfortable with their breathable design, but still supports and protect tiny feet as they venture out into the world. The closed toe design helps protect tiny toes from the elements and limits the amount of dirt getting in. Flexible but fatured notched rubber on the outsole to prevent slippage, these are great for little ones constantly on the go. Dress up or dress down; these Femizee sandals are ready for anything. It’s a great closed-toe design that delivers on its performance promise but also is pretty and comfortable enough to please fussy little ones. Poolside or beachside, you know that finding quality children’s sandals that can hold up to repeated water exposure is difficult. More often than not you are stuck with buying plastic or foam shoes that fall apart quickly and stink even quicker! If you have a seaside trip planned this summer the Salt Water Sandals is your ticket to an odor-free family vacation. These shoes are made of genuine leather and have been engineered to withstand water submersion. Ocean or lake, salt or not, your little one is free to wade on in without worrying about stepping down on a sharp stone with their delicate feet. These shoes stiffen slightly when wet but do not wrinkle or shrink. 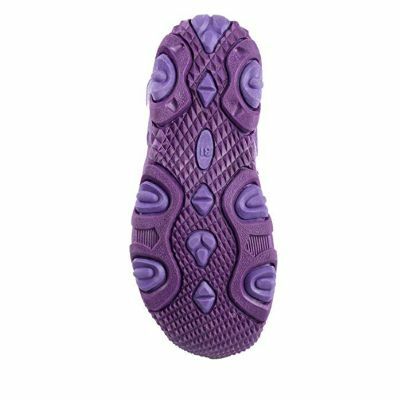 The inner sole is quick drying and provides a secure fit that won’t slip around when wet, preventing blisters and guaranteeing a comfortable fit. Their two-piece design matches well with casual shorts and t-shirts and dresses equally so they are the right fit for every occasion. These are the perfect sandals for little feet as the adjustable straps can actually grow with them to last them all summer...and maybe even the next! 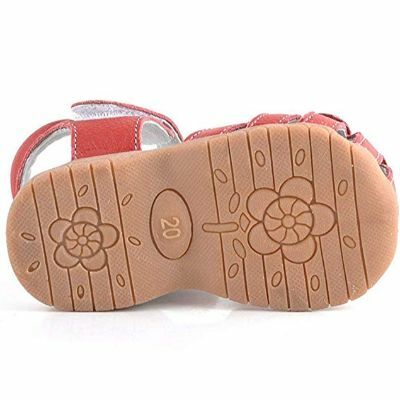 ded breathe hole make the sandal a great pick for active toddlers always on the go. 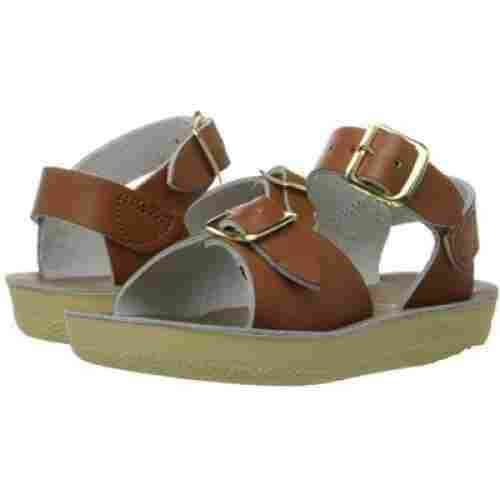 These sandals feature an open two-piece style with dual buckling straps across the top of the foot and at the ankle. Having two separate closures provides for a more precise and unique fit that can both support early walkers and stay on securely for little ones who love to run. Multiple buckle holes are available on each strap to allow these shoes to expand through growth spurts and last all summer. The rubber sole and ankle straps provide support for their arches and ankle to reduce the chances of accidental falls or injuries. 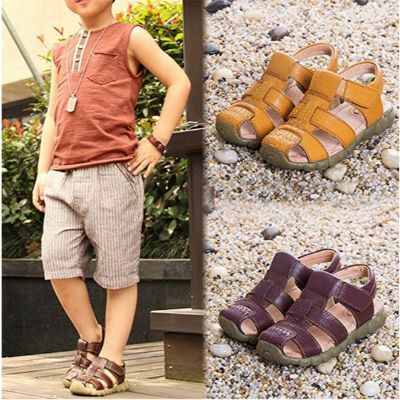 These sandals give your child a chance to wear ‘big kid’ shoes as they have a more adult style and are even manufactured in large enough sizes that you may be able to get a matching pair for yourself! 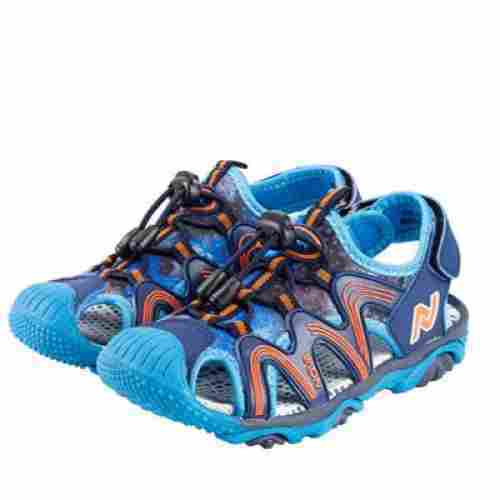 Strap your little adventurer in with these closed-toe casual sandals from Femizee. Imported leather means these shoes are soft, with cushioned insoles for extra comfort. It’s both strong and flexible. Having shoes that are protective is important, but you also want a pair that allows them to move their feet in a normal, healthy fashion, so that they don’t wind up rolling ankles or with foot problems as they compensate for stiff soles. These sandals will keep baby’s feet securely strapped in. They’re made with a thick sole to protect against hard surfaces, but are flexible so your tot can still move their feet freely. 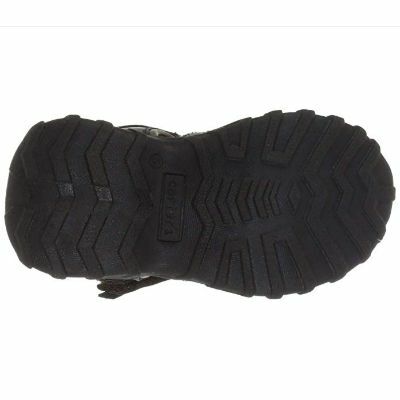 A rubber sole protects against sharp objects and rough surfaces. The closed toe in front keeps dirt out, while the strap at the ankle keeps little feet in. Durable, flexible, and adjustable, these shoes are lightweight with an water-friendly upper portion. 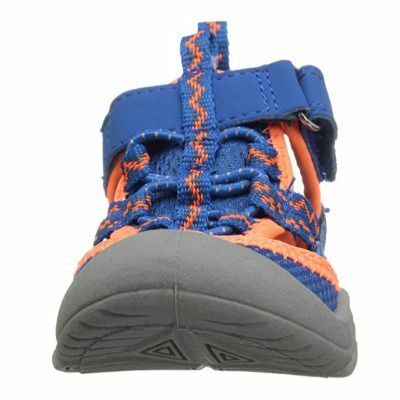 The hook-and-loop closure will keep tiny toes in place as your child runs, jumps, and plays to their heart’s content. Sporty and stylish, these sandals are great for the outdoors. They contain a hook-and-loop strap closure, making them easy to slip on and off, and for little ones to eventually be able to fasten themselves. 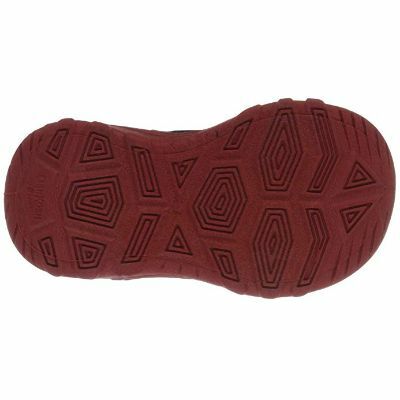 The rubber sole keeps them sturdy, while a soft pigskin insole provides cushioning and shock absorption. 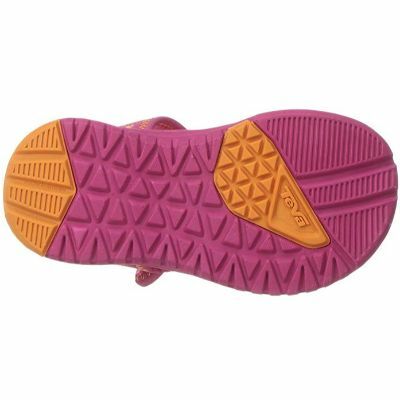 They’re closed-toe to keep debris out, and the rubber sole provides traction so toddlers aren’t slipping and sliding around as they play and explore. These sandals come in four colors, and can be worn to both casual and formal events. These will stay put on your little one’s foot, without being too tight or constricting. They’re also easy to fasten as toddlers become more self-sufficient and responsible. This style is pretty popular, perhaps due to how well made it is and the value for its price point. These are versatile, so you won’t need to splurge on multiple sandals for your tots; wear these to play outdoors, make your birthday party rounds, or attend more formal celebrations. We can’t say for sure that your kid will sleep all night, every night. Nor can we promise that they won’t put that lollipop in their hair for safekeeping the second you turn away. We can guarantee, however, that they will grow out of their shoes-right before school starts or the week after you bought them three new pairs. 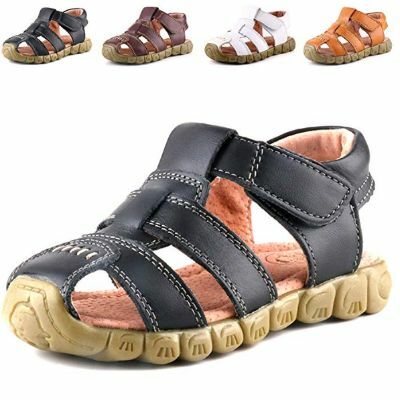 These shoes feature a sandal-sneaker style that fully encloses your child’s feet while still providing a breathable atmosphere to reduce sweating and help prevent overheating. The velcro-style strap is large enough to manipulate with little fingers, developing fine motor skills and encouraging self-independence. Best of all, there are no tags or stitches on the interior of the sandals which means your little one can wear these, wet or dry, all summer without blisters. The closed toe front provided extra protection against stubbed toes and keeps dirt from accumulating. The bungee cord style lacing and soft outsole give this shoe a flexible yet secure fit that can expand to support average and wide feet equally. Nova has us in Utopia over these prices! Reviewers are calling these sandals comparable if not better than similar name brands but at a fraction of the price, and we can’t disagree with them! When it comes to your child’s feet it’s important to find a pair of shoes that are supportive and durable but it’s just as important to find a good bargain because they’re probably going to outgrow them before they destroy them. 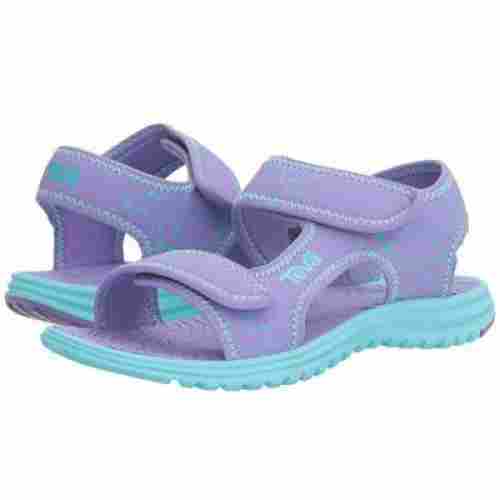 Fortunately, Nova has you covered with their line of Utopia Toddler Summer Sandals. These sandals look like Carters, feel like Adidas, and come with a price point that makes Walmart blush! These are the perfect addition to your little one’s summer apparel that can match every outfit with a comfortable and supportive shoe that you won’t mind replacing next year. This sporty sandal looks super cute and offers a great support system while also providing a secure fit with the upper being constructed of quality synthetic materials. The latching system easy to get secure with the overlaying straps that simply Velcro when placed together. 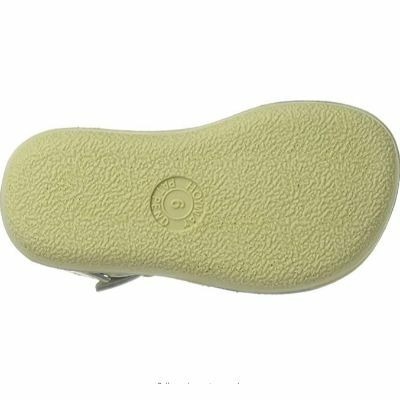 Both the sole and the upper have been constructed of quality synthetic materials that dry quickly and offer optimal air flow. This simple sandal is sporty and supportive while providing a stable support system. This pair of sandals offers a sporty look without losing the a great latch closure system. The design is easy to latch and provides great support while not featuring lots of materials that keep feet from being able to breathe. Easy to put on while giving supreme support and comfort is where this sandal hits the mark. The simple design with quality materials gives this sandal a great fit plus the easy latching system is a bonus. Sandals are a great way to engage toddlers to engage in a self-care development activity, promotes independence development skills, and encourages fine motor skill development. Bringing together both development skills and life skills through a simple task as putting on sandals can be achieved with this design of footwear. Toddlers are some of the messiest little people and when shoes are washable it is a bonus. These sandals are just that. They are washable and lightweight making them the perfect footwear for warm weather activities. This sandal offers a hybrid design of both the sneaker and sandal. 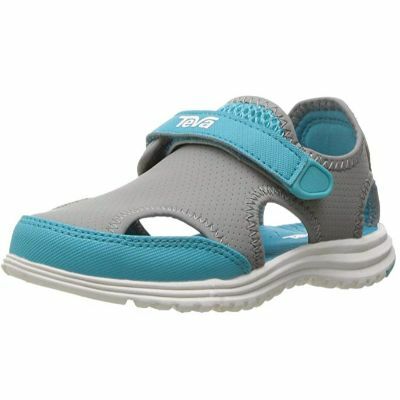 It features the protective toe shield and support of a sneaker, but the breathability of a sandal. It makes a wonderful sandal to place on those toddlers’ feet that are always getting into something messy. This pair of sandals is comfortable and can be thrown in the washing machine. The synthetic sole and upper make for a lightweight design that is great for those summer adventures. 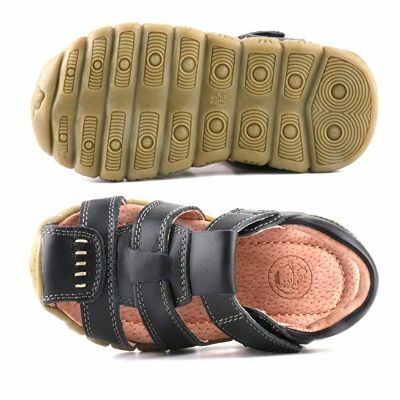 Plus the closure system is easy to latch making this closed toed sandal perfect for toddlers. When toddlers are presented with shoes that are designed for them it encourages their motor skill development, promotes their social development, and boosts their self-esteem. Any sandals that are washable and easy to put on are sandals that should be in every toddler’s closet. Love any sandal that offers protection and support. These sandals fit that description perfectly. They are machine washable which it the added bonus. Simple and cute is the design that was achieved with this pair of sandals. There is nothing better than finding a pair of sandals that are easy to put on and offer just a simple design that is great for all occasions. Simple and sweet with a great price tag is what these sandals have to offer. The added closed toe design just makes it an even better buy. The benefits of toddlers being able to take their own shoes on and off just don’t end with convenience. It also helps them develop a sense of self-pride, boosts their fine motor skill development, and encourages their social skill development. The simple style and design provided with these sandals are a great way to encourage them to start putting on their own shoes. Sandals are something that everyone likes to wear in the summer especially when they can be simple and sweet like these sandals. 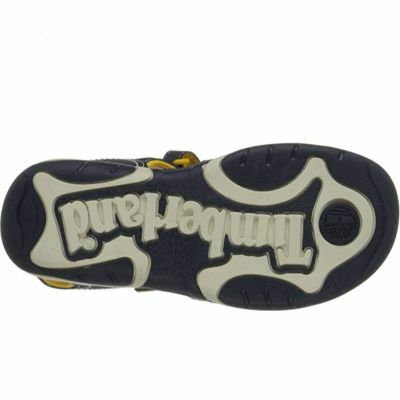 The solid color upper design with the closed toe and rubber sole provide style without missing the mark on protection. Sandals with a simple latching system helps toddlers to take their own shoes on and off. These sandals provide just that. This sandal offers a Pu Suede upper with a synthetic rubber sole that provides great traction while keeping it simple on the upper. The latching system is also designed with simplicity in mind. It is easy to secure and easy to take off for little hands. These sandals are cute and offer protection on the toes of little ones need while not taking away from the simple design. 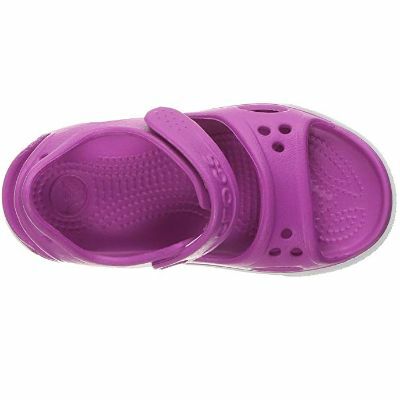 The famous maker of the Croc slip-on shoe now brings to the market these awesome little toddler approved sandals. They are constructed of super light foam materials known as ‘croslite’ that make them great for little feet. 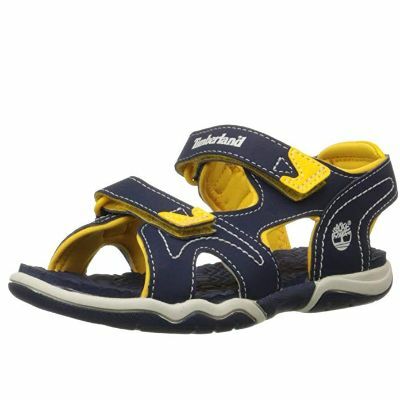 The sporty style offered with these sandals also provides a secure and tight fit with a fold over latching design. The added plus of the croc material features that lightweight and comfortable fit that Croc is well known for. Constructed from synthetic materials the super molded sandals are ready to handle any adventures that toddlers are ready to take them on. 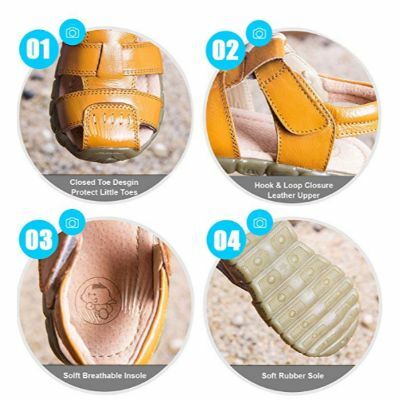 Easy to slip and latch is a plus for any toddler sandal the plus side of these sandals they also offer a lightweight foam design with a great support system. 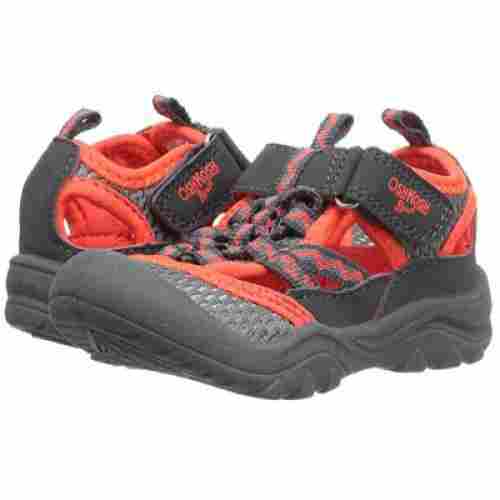 They are durable and well-constructed for a rough and tuff toddler lifestyle. Quality materials and secure fit is what makes this pair of sandals great for the little feet of toddlers. 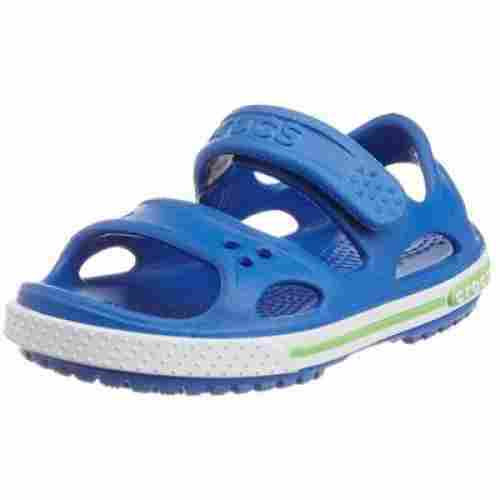 From the well-known shoe company Croc, these sandals have been designed to provide toddlers with support, protection, and natural foot movement. They also provide toddlers with the opportunity to engage in fine motor skill development activity, promotes and builds self-confidence, and engage social development skills. These sporty sandals bring together function and design. When creating the list for the 15 Best Sandals for toddlers and kids our experts looked at many different kinds of sandals and reviewed the reviews to determine what criteria parents were looking for in a sandal for their toddler. After lots of research it the criteria came down to comfort, support, and style. Once the list has been created with those being the main points of criteria, then the list is broken down to the 15 best by reviews. We want to offer nothing but the best for our readers and to make sure that happens we suggest not products that have a star rating of less than 3.8 out of 5 stars. Parents want to make sure that their toddler’s feet are well supported. It is not only important to make sure they offer support but they are comfortable as well. Comfort and support are the two most important things about sandals for toddlers. The style is something that adds to the breakdown of the criteria. This allows our experts to only suggest sandals that are great in all the categories. 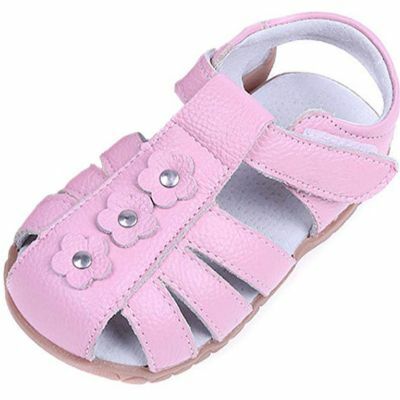 When selecting sandals for a kid or a toddler it is all about the fit and form and less about the fashion. Making sure that the shoes fit well and form well to their feet is the easiest way to make sure you are selecting the best sandals for your kid. There are plenty of sandals out there that are super cute but are not always the best fit for toddlers. Then there are the sandals that fit well and are super cute. That is what you are looking for. Shopping with a toddler can be tough enough, but finding just the right sandals can be hard. So make sure that you follow a couple simple rules before getting too frustrated with the situation. Always get them measured each time you purchase new shoes. This makes sure that growth has not occurred since last buying shoes. Then make sure to make sure that the new sandals have some room for growth, but not too much for that will make them slide around. A good rule of thumb is a thumbs width should do the trick. Never buy shoes by size, always make sure to try them on first. Then find the right material for your sandal. Sandals come in lots of materials to make sure and do some homework on what would be best. Then just get in the groove and shop away. 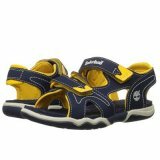 When looking at the features of good kids sandal you want to make sure the sole of the sandal is very supportive. Support is important to the growth of their feet and also allows them to be able to walk with a better stride. Next thing to consider is protection. Protecting their feet when wearing sandals can sometimes be hard. So selecting a pair of sandals that best protect their feet for the activities that they will be engaging in is the best way to make sure they are well protected. Lastly, make sure that the sandal fits well. If they are too small it could cause pain and not promote growth. If they are too big they could rub causing blisters and be very uncomfortable. Having a toddler ‘fitted’ for sandals is something that really helps. There are many features that sandals offer, but making sure those features are the best for your active toddler is the most important. 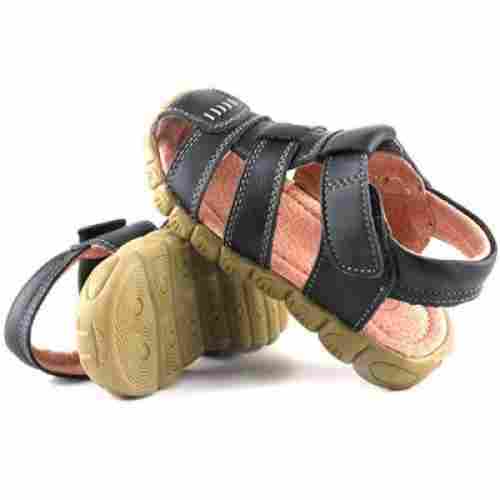 The features that should be considered when buying sandals for kid/toddler are; support, protection, and fit. Parents should make sure that their toddler’s feet are well supported and protected. It is something that is very important to their growth. Their little feet are growing and need the proper support to be able to allow them to grow in the most natural way. Footwear can be very uncomfortable and harmful to their feet if they are not the right kind for their feet. When babies first learn to walk it is very important for them not to wear shoes. Shoes can make them slip, stumble, and just get in the way. This is a rule to use when they are learning to walk at home or in an environment that would not cause harm to their feet. Once they have the walking down and start to walk outside the home or when out in about it is time to start thinking about they wearing shoes. Infant shoes are designed to protect and support their little feet, but you want to make sure they do nothing but that. When babies are stable and ready venture out walking it is time to select their first walking shoe. Shoes that are designed for first walkers should offer just the right amount of protection, stability, and support. Function in babies shoes is the number one priority here fashion will have to come later. The shoe should offer a wide base, a quality material construction, and have superior craftsmanship. These are the feet they will walk on the rest of their life. It is very important to give them the best base that is possible when learning to walk in shoes. q: Should toddlers always have shoes or sandals on their feet? Toddlers should only have shoes or sandals on their feet when it is needed. Like when they are outside or they need something to warm their feet. When they are first learning to walk it is important to make sure they have time to learn to walk without them. Shoes and sandals offer protection and support from the elements. When they are safe and able to walk without shoes or sandals it is important to allow them too. q: What is the most important thing to look for when buying sandals for a toddler? When buying sandals for a toddler you want to make sure they offer; a supportive base, protection, and fit just right. These are the three most important features to review when buying toddlers sandals for the warm weather months. q: Is toe protection important in sandals for toddlers? Toe protection is important for in sandals for toddlers when the activity that they are doing in the sandals require it. It is also a nice feature to have but it is not the most important feature. q: Should the sandals be slip resistant? It is important for sandals to offer a slip resistant sole when you will be using the sandals in or around water. When water is present it is easy to slip and fall. When you have a slip resistant sole it helps prevent that from occurring. q: Where can I find the sandals that are on the 15 Best Sandals for Toddlers list? 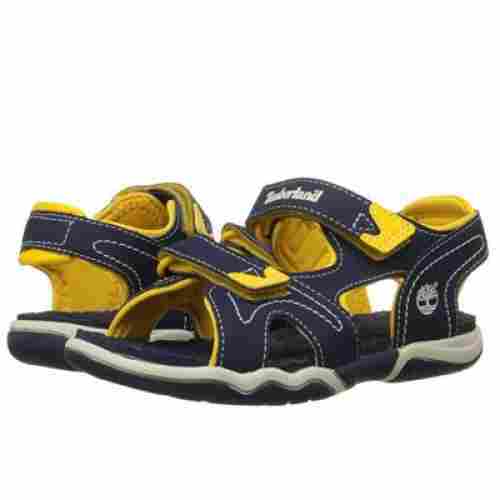 The sandals that are listed on the 15 Best Sandals for Toddlers list can be found by clicking the link below the product. The link goes directly to Amazon where the sandals can be purchased. q: When should babies/toddlers start wearing shoes/sandals? Babies and toddlers should start wearing shoes when they are ready to walk in conditions that require them to have to wear shoes. Protecting and supporting one thing that shoes/sandals provide for them so make sure that they are wearing them when the time comes, but they are not needed before that.